The latest SMOK MAG GRIP - BLACK RED FULL kit a new member of MAG family, still continues the features of handheld mod, exquisite fire key, and magazine release. New V2 S1 & S2 coils included. 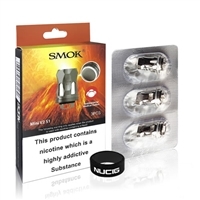 Buy from NUCIG UK. 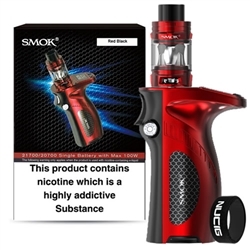 SMOK MAG series has long been fancied by vape fans for its stunning appearance and strong performance. SMOK MAG Grip, a new member of MAG family, is also worth looking forward to. It still continues the features of handheld mod, exquisite fire key, and magazine release. In addition, some fresh design concepts have been added: the distinctive OLED screen area and UP/Down buttons underneath perfectly blend the data reading and data adjusting together. And it is compatible with 21700, 20700 and 18650 battery; what's more, a single 21700/20700 battery can offer a power output up to 100 Watts with high performance. MAG Grip comes with TFV8 Baby V2 tank adopting two new coils-Baby V2 S1 and Baby V2 S2, which are custom-made coils for Stick series battery with intense clouds and flavor. Everything to like about this new kit. Delivered within 48hrs - spot on !!! I have had an Alien kit for over 2 years now and was looking for an upgrade. This kit ticked all the boxes, really pleased with it and how quickly it was delivered by the guys at nucigs.